We’d love your help. Let us know what’s wrong with this preview of Sign of the Dove by Susan Fletcher. Once again, dragons are threatened by bounty hunters and a young girl must find a way to lead them to safety. . . . The story itself is fast-paced and features a multiplicity of characters and events.--School Library Journal. To ask other readers questions about Sign of the Dove, please sign up. This series is fantastic. I'm only sorry I never read these when I was actually in the age group the author was targeting. As a public librarian, I will happily recommend these to anyone looking for similar reads to Patricia Wrede's Looking for Dragons series. (That's how I discovered these myself, actually). Susan always thinks of creative things. Because of the dragon sculpture she brought for her husband, she wrote books about dragons. This book is connected to the Dragon’s Milk[which i haven’t read yet]. At first, i thought is wasn’t a good book until i read it. It just made me to read more and more. I kind of starting to like her books because I love dragons. I was reading the book and it was in my mind, like i was in the book. There were many parts where she had choose, who could she trust, beca Susan always thinks of creative things. Because of the dragon sculpture she brought for her husband, she wrote books about dragons. This book is connected to the Dragon’s Milk[which i haven’t read yet]. At first, i thought is wasn’t a good book until i read it. It just made me to read more and more. I kind of starting to like her books because I love dragons. I was reading the book and it was in my mind, like i was in the book. There were many parts where she had choose, who could she trust, because in the story, if you had green eyes, you are a dragon and people killed dragons. You can tell her emotion if she’s like in a hurry or panicking. You can kinda tell if something bad or good was about to happen, but then a new chapter comes up. On the whole, this series is incredibly uneven. This is the last instalment that I read, and it will remain so, as I picked up the fourth and found it such a bizarre departure that I lost interest about ten pages in. As is evidenced by my rating, I didn’t particularly care for this one either, but it certainly wasn’t a DNF, and my ratings go by Goodreads’ elaborations. Two stars = It was okay. Chronologically, Sign of the Dove takes place several years after Dragon’s Milk, and it also takes after On the whole, this series is incredibly uneven. This is the last instalment that I read, and it will remain so, as I picked up the fourth and found it such a bizarre departure that I lost interest about ten pages in. As is evidenced by my rating, I didn’t particularly care for this one either, but it certainly wasn’t a DNF, and my ratings go by Goodreads’ elaborations. Two stars = It was okay. Chronologically, Sign of the Dove takes place several years after Dragon’s Milk, and it also takes after the first book in style and intent. Writing-wise, it’s a bit of a mess. Not so bad that I had to force myself to continue, but definitely a let-down after the writing had improved so much in Flight of the Dragon Kyn. Not only did the stilted Ye Olde High Fantasy Speak style of word choice and bad dialogue return, but there was the inclusion of a “harper’s tale” inserted between each chapter. I was not a fan of the harper. He added next to nothing, his character is an obnoxious cliché, and the style of his chapters is so “Now hear ye, gentle listeners, as I, your amazing yet humble harper elucidate this grand and enchanting mystery.” The pomposity was stupid. If it weren’t for the point at which he exposited what happened to characters who’d been separated from the main character, he would have absolutely no reason to be there at all. Not that we even needed to know what those characters were doing. There are also a few small but weird contradictions to continuity. This book is the story of Kaeldra’s second-sister Lyf. Like Kara, Lyf was saved from vermilion fever by dragon’s milk. For some reason, this gave her the ability to ken with birds, but when Lyf does it, the kenning is a dangerous thing that removes her self from her body and traps it in the bird. Their other sister is married, but not to the young man she granted her amulet in the first book. Lyf also makes no mention of an amulet of her own, which means that an entire aspect of the story world’s culture is just gone. When Queen’s men come to the house looking for Kaeldra, who is in hiding, Lyf is determined to be in similar danger and so the grandmother sends Lyf to stay with Kaeldra. Thanks to her hand-wringing mother, Lyf believes herself too weak to do or be responsible for anything. When she arrives, she won’t just be sheltered and coddled. The rest of the dragons are hatching, and Kaeldra works with a kind of underground network that identifies itself by a dove sign to get the draclings out of the world. Lyf is left on her own to help in this goal. Indeed, she finds herself responsible for more then ten draclings as well as her small nephew. She has to learn to depend on herself and not look to others to take care of her. She is forced to become something of a parent, and is not always successful. Things can get pretty dark, but the end is ultimately a happy one, although it’s a long time in coming. I loved the theme of growing up. There are a lot of ways for a coming of age story to go, and this one does not shy away from failure, consequences, or just plain ill fortune. Lyf toughens up because she needs to, but she also continues to feel like what she is--a scared young girl--in the way that she keeps wishing for someone to step in and help her. She’s in her over head, and she knows it. She’s a great character, struggling without descending into whinging. The author has a clear vision of her interpretation of dragon's physical and behavioral characteristics. I appreciated the main character's realistic attitudes about her own behavior as a 'reluctant hero,' and this was an overall well paced, fun read. Picked up this book from a used bookstore and thought it might be a fun read. The night I began reading "Sign of the Dove," I quickly discovered that I could not put it down. In fact, I stayed up a good portion of the night trying to finish the delightful tale. The story took me by surprise. The author is a good writer--witty and creative. Sign of the Dove is the sequel to Dragon’s Milk , although it is the third entry in the series. I haven’t read the second entry, which is a prequel, so hopefully I didn’t miss much. But I do want to go back and read it sometime. This sequel follows Kaeldra’s sister Lyf, not Kaeldra herself. But I liked that Kaeldra wasn’t just some background character and she was very much involved with the plot … in a manner of speaking. 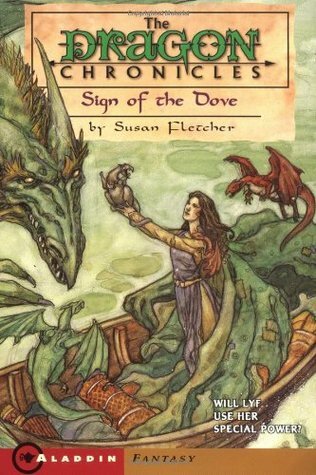 It is also great to see returning characters Jeorg, Yanil and family, and Sign of the Dove is the sequel to Dragon’s Milk , although it is the third entry in the series. I haven’t read the second entry, which is a prequel, so hopefully I didn’t miss much. But I do want to go back and read it sometime. This sequel follows Kaeldra’s sister Lyf, not Kaeldra herself. But I liked that Kaeldra wasn’t just some background character and she was very much involved with the plot … in a manner of speaking. It is also great to see returning characters Jeorg, Yanil and family, and Lyf’s family – and they also play their roles without detracting from a story by means of unnecessary cameos. This book is not as gritty as Dragon’s Milk, but just as dark. Again, given the circumstances, we can’t expect to avoid death and destruction. This book also has the responsibility theme as the first one, with the added theme of sacrifice. Lyf is responsible for thirteen draclings in addition to Kaeldra’s three-year old. Add to that the fact that Lyf has been pampered all her life and she is not the responsible older sister type that Kaeldra was. The stakes have been upped. Throughout the novel Lyf explores the question “how much should you do for others for no personal gain?” Throughout the book she has to go to help to a variety of people and each of them responds differently and adds different perspectives to the question. Heroine and dragons. A good story. After reading the first 2 books in the series, I was really psyched to read book #3. While not as strong a story as the first 2, I still thought the story was well told. A few things were done differently in this book that I really liked. First of all, there were 2 stories going on parallel to each other. Fletcher's use of the Harper's Tale to keep one of the plot lines going while not interfering with the other was, in my mind, a stroke of genius. It was fitting and much better than the typical After reading the first 2 books in the series, I was really psyched to read book #3. While not as strong a story as the first 2, I still thought the story was well told. A few things were done differently in this book that I really liked. First of all, there were 2 stories going on parallel to each other. Fletcher's use of the Harper's Tale to keep one of the plot lines going while not interfering with the other was, in my mind, a stroke of genius. It was fitting and much better than the typical point-of-view-chapter-change. The harpers tale really gave me a feel for the time-period as well. It was so much easier for me to read as if I was listening to someone tell me the story like bards used to. Also, the romance was extremely subtle and postponed, so i thought for a second that it wouldn't really be there. It was super subtle and I felt there could have been just a tiny bit more (just my preference). Lyf's character was well-developed and a good change of pace for the series. While the previous heroines were strong and eventually dead-set on saving the dragons, Lyf didn't want to. She wasn't as strong as them physically OR mentally, she kept wanting to pass her troubles onto someone else, but she realized what she had to do in the end. I like that about her and ALL of Fletcher's Dragon Chronicles heroines. They are all well-developed and strong in their own ways. While you could compare Kaeldra to Kara to Lyf, I don't really find a need for it. Each heroine stands on her own regardless of what the others have done. This is the final book of the Dragon Chronicles. In this story we follow Lyf, the very adopted-sister that Kaeldra risked her life to obtain dragon's milk for in the first book, as she deals with her own Dragon-Saying ability. Their land is ruled by a feared Kragish Queen bent on creating an unbeatable army by killing and consuming Dragon's legendary meat. Kaeldra, now married with children, works along with others to save the Dragons in a secret organization that identifies one another with the This is the final book of the Dragon Chronicles. In this story we follow Lyf, the very adopted-sister that Kaeldra risked her life to obtain dragon's milk for in the first book, as she deals with her own Dragon-Saying ability. Their land is ruled by a feared Kragish Queen bent on creating an unbeatable army by killing and consuming Dragon's legendary meat. Kaeldra, now married with children, works along with others to save the Dragons in a secret organization that identifies one another with the symbol of a dove. When Lyf falls into danger with her green eyes and ability to communicate with birds she must go into hiding with Kaeldra. Lyf is a small, young girl of 12 who is used to being coddled by her mother due to her past ill health, but in this book she is forced to find her own strength when she is separated from Kealdra by a treacherous brother-in-law with a hidden agenda. Lyf finds herself responsible for not only her own life and the life of Kaeldra's young son, but also for the lives of 13 small draclings. In this novel Lyf undergoes a huge transformation from a "milk-sop" who was never allowed to even attempt to do hard work, to a brave, caring, and responsible young woman who proves that she can do anything. It seems Fletcher's writing improved as she went along. This book, the third in a trilogy, is better written than the second, which was better written than the first. The plot was original and well-paced. One of the strengths of the books, which was only evident after having read all three of them, is that Fletcher was able to create three "dragon girls," each with her own distinct character, inclinations, and intneral dialogue. Lyf, the sister Kaeldra went to fetch the dragon's milk to save in It seems Fletcher's writing improved as she went along. This book, the third in a trilogy, is better written than the second, which was better written than the first. The plot was original and well-paced. One of the strengths of the books, which was only evident after having read all three of them, is that Fletcher was able to create three "dragon girls," each with her own distinct character, inclinations, and intneral dialogue. Lyf, the sister Kaeldra went to fetch the dragon's milk to save in the first book, Dragon's Milk, has acquired green eyes and the ability to talk to dragons and birds as a result of drinking the dragon milk as a child. Also as a result, she's been cosseted, and told she's frail and sickly, and so she's grown up to think of herself that way. Her emotional journey, as she realizes she's much stronger than her mother gives her credit for, is as interesting as the physical journey she undergoes as she tries to get the last fourteen draclings to safety. This was a bathroom book. We pick a book and set it in the bathroom just to get things moving. that being said it took a while to finish. But it was getting so good that I had to finish it that day. This book is the 3rd book in the Dragon Chronicles and is from Lyf's point of view and also the Harper's point. It was pretty fun with the Harper and then serious with Lyf. At first I was annoyed with Lyf and her poor weak self, but I told myself to be calm and go through and things did get better. Wou This was a bathroom book. We pick a book and set it in the bathroom just to get things moving. that being said it took a while to finish. But it was getting so good that I had to finish it that day. "If you had never known them, you wouldn’t mourn their loss. But if you had known them… the world would ever have a great, gaping hole in it, where splendor once had dwelt." This, the third book in the series, is the sequel to "Dragons Milk," (as the second book in the series, "The Flight of the Dragon's Kyn" is a prequel. We see the effects of consuming dragon's milk on a now grown Lyf - who can now speak to dragons. Lyf must make the same choices her predecessors have in subsequent books: leave "If you had never known them, you wouldn’t mourn their loss. But if you had known them… the world would ever have a great, gaping hole in it, where splendor once had dwelt." Lyf must make the same choices her predecessors have in subsequent books: leave home to protect the dragons. Along the way, Lyf must learn to think for herself, to be brave, to make choices that are not always easy to make; she'll make new friends and meet new creatures. Lyf was both a somewhat minor character, and the whole driving force behind the first book in this series. In this third book, she takes center stage. Lyf was always cossetted as a child, especially by her mother. Now however, as the last of the dragon eggs are hatching she must leave that leisured life behind and accept a great adventure. Lyf must fight to save the dragons, and show she too has great gifts. I loved to see Lyf develop as a character, she really grew into a remarkable young woman Lyf was both a somewhat minor character, and the whole driving force behind the first book in this series. In this third book, she takes center stage. Lyf was always cossetted as a child, especially by her mother. Now however, as the last of the dragon eggs are hatching she must leave that leisured life behind and accept a great adventure. Lyf must fight to save the dragons, and show she too has great gifts. I loved to see Lyf develop as a character, she really grew into a remarkable young woman. I also liked that Kaeldra made small apperances, tying all the books together. A fine conclusion to the series. This is the sequel to DRAGON'S MILK, whereas FLIGHT OF THE DRAGON KYN is a prequel. This novel is the story of Lyf, the sister whom Kaeldra saved by fetching dragon's milk from the mother dragon in the mountains. Because of that milk, Lyf now also can mind-speak with the dragons and their draclings. With the growing hostility toward dragons, Lyf must see that the dragons reach the final eggs they laid 100 years prior, so that all the dragons can settle in a safe land far from humankind. A wonder This is the sequel to DRAGON'S MILK, whereas FLIGHT OF THE DRAGON KYN is a prequel. This novel is the story of Lyf, the sister whom Kaeldra saved by fetching dragon's milk from the mother dragon in the mountains. Because of that milk, Lyf now also can mind-speak with the dragons and their draclings. With the growing hostility toward dragons, Lyf must see that the dragons reach the final eggs they laid 100 years prior, so that all the dragons can settle in a safe land far from humankind. A bit predictable, but it was nice to see the child Lyf come out of her mewling pitiable state and become a regular child, with friends and a willingness to fend for herself. I could have done without the harper's interruptions, but they did add a little bit of whimsy to the tale, so all was good. I would like to have seen less of the travel weary discussion and more discussion, so that we have more of a feel for why, but overall this is much better than the previous two. Unlike the other 2 books in this series, this one genuinely belongs as #3, so that helps. But Lyf is just not as compelling as her foster sister. And the way the story is broken up with the harper interjecting every other chapter makes the book choppy and confusing. Interesting idea, not well executed. Glad I only borrowed this form the library! Susan Fletcher's books are charming and evocative. I enjoyed this book nearly as much as the beloved series opener, DRAGON'S MILK. The reason for the lost star is a plot line involving a secondary character (the Harper's Tale) that I found unnecessary and distracting. I highly recommend any of the Fletcher's dragon books to anyone who loves animals. Highly amusing baby dragon antics. Cute story told in an interesting way - every other chapter is told from Lyf's perspective, showing her thoughts and feelings and actions, and every other chapter is a short intervention where an old (wo? )man tells us what's going on with everyone else. Nothing world-changing, but it was fairly enjoyable. This is my favorite of the first three Dragon Chronicles. Lyf, a sheltered 12-year-old, flees her home, pursued by soldiers and bounty hunters. Soon she is lost in the mountains, with her baby nephew and 13 baby dragons to care for. Lyf feels so weak and incompetent at first, then she finds courage and endurance buried inside. Her personal journey is appealing and her adventures exciting. Another addition to the fantastic Dragon Chronicles!!!!!!!!!!!!!!!!!!!!!!!!!!!!!!!!!!!!!!!!!!!!!!!!!!!!!!!!!!!!!!!!!!!!!!!!!!!!!!!!!!!!!!!!!!!!!!!!!!!!!!!!!!!!!!!!!!!!!!!!!!!!!!!!!!!!!!!!!!!!!!!!!!!!!!!!!!!!!!!!!!!!!!!!!!!!!!!!!!!!!!!!!!!!!!!!!!!!!!!!!!!!!!!!!!!!!!!!!!!!!!!!!!!!!!!!!! Having read the first books in the series at an early age, I remember being enchanted with the story, the world the author created, and the characters she brought to life. I found this story to be ... less than the first. It was enjoyable, but still, less. I would recommend this book to any young audience. Not nearly as good as the other two in the series. About halfway through I found myself determined to finish it just for the sake of finishing it. The last bit of the book picked up and held my interest. But mostly I just found it lacking what I liked about the other books. When I read this I had no idea it was part of a series, I really wish I had read the other books when I had the chance, I feel I'm alittle too old to be reading them now. I remember this book being amazing though. Follows Kaeldra's sister, Lyf, who has been spoiled because of her sickness when she was very young. Suddenly forced out on an adventure on her own, Lyf has to finally learn to take care of herself as well as dragons! Great books for younger readers who enjoy fantasy novels. Oh good, this sequel to Dragon's Milk, the third book in this series, once again recaptures the adventure and suspense we had in the first book. One more book left in this series. I'm sure I'll finish it quickly. With a me Librarian Note: There is more than one author in the GoodReads database with this name. See this thread for more information. Please do, however, be aware that this thread is no longer kept up to date.